Randy Jackson believes that life is all about taking chances. That attitude guided him through a legendary career in the music industry and made him famous as the longest-serving judge on the TV show American Idol. And it continues to fuel his collaboration with Zyloware Eyewear, the New York-based company with which Jackson created his eponymous eyewear collection. “As a noted style maker, Jackson was the perfect fit when Zyloware decided to create a new line of attractive, affordable men’s frames,” says President, Chris Shyer. The collection fills an important need for male consumers who want stylish ophthalmic eyewear and sunwear in on-trend shapes and colours at affordable prices. Shyer says the line is very fashionable and appeals to many different tastes. Jackson collaborates with Zyloware’s design team on new ideas, colours, textures and materials, he notes. In addition, the company uses its 90-plus years of experience to create products with the styling, fit and quality its customers expect. Jackson, 58, says he loved wearing glasses from the first time he put on a pair at age 15. And he was inspired to develop his own line after struggling to find spectacles that fit properly. The collection includes plastic, metal and semi-rimless frames with features such as modern double bridges, two-tone colourations and extended-fit. All logos are positioned on the interior temple tip. The Randy Jackson 3018 utilizes the vintage look of black-to-light-gray gradient on the front. The sporty temple is super-thin, extremely durable, handmade acetate. Model 1055 uses an innovative combination of stainless steel sheet metal and eyewire construction. The frame has the extended-fit feature, which makes fashion eyewear available to men who needs a larger fit. It is thin, yet creates a cool effect with a triple bar bridge. The Randy Jackson 1042 is inspired by vintage frames but uses metal and unique colorations for a frame that’s much lighter than earlier vintage products. It features a deep lens shape and multi-coloured front. Interestingly, 20 per cent of Randy Jackson eyewear consumers are women. “We believe this collection started a trend among some women who want to make a statement by wearing big, bold, fashion eyewear,” Shyer says. 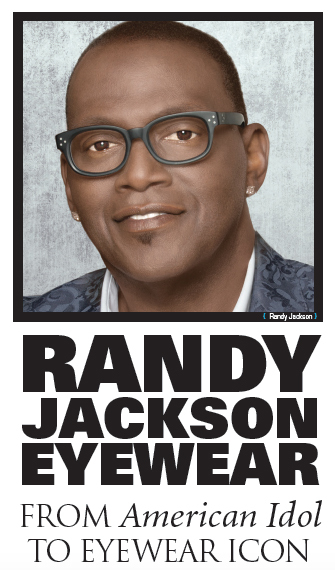 Outside the U.S., the market for Randy Jackson Eyewear is excellent. That’s particularly true in Canada, where Jackson is well known from his time on American Idol. In other parts of the world, where people are less familiar with him, the line is also in demand because of its combination of style, comfort and affordability. A native of Baton Rouge, LA, Jackson’s success in the eyewear field is the latest in a long line of outstanding accomplishments. In the late 1970s, he collaborated with jazz legends Jean-Luc Ponty and Herbie Hancock, then helped to create hit records for Smokey Robinson, Aretha Franklin and Madonna. Jackson recorded and performed with the likes of Bob Dylan, Journey, Keith Richards, Carlos Santana and Jerry Garcia. He has over 1,000 gold and platinum plaques to his name, with collective sales exceeding 200 million copies. Today, he is also busy with charitable work, acting as Goodwill Ambassador for Save the Children U.S. and working with Ronald McDonald House Charities. With everything he undertakes, Randy Jackson proves that the formula works.